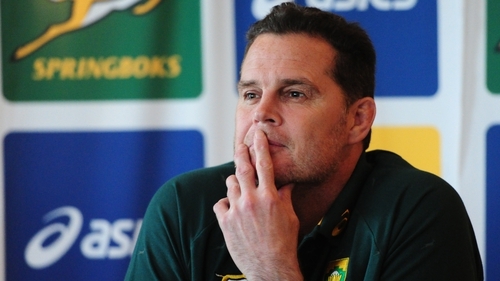 In a somewhat surprising move, Springboks coach Rassie Erasmus has announced his decision to step down as South Africa coach after next year's Rugby World Cup in Japan. Erasmus, who was named Springhboks coach last February after the sacking of Allister Cortzee, is also the Director of Rugby at SA Rugby. He is contracted to the latter position until 2023 and that's where his focus will solely lie after the conclusion of the World Cup. On maing the decision, the former Munster coach told South African television: ""I'm only head coach until the World Cup next year," he said, noting that he has a six-year contract only as Director of Rugby. "The moment I am finished with this [head coach role] and for the next six months, I will be involved with [the other SA Rugby structures] a lot." Ersmaus revealed that he agreed to take the national job because he felt it wouldn't have been fair to appoint an outsider to prepare the team for the World Cup. "For somebody from the outside to all of a sudden have just 18 Test matches to prepare the team for the World Cup, I didn't think that would be fair to that coach," he added. It would have been a 'suicide job'. And for myself, who's been in the position before [as director], it made sense when they asked me. "Obviously, the flagship of SA Rugby is the Springboks. That was the first stop that we had to fix; the previous year, the only teams we beat were Italy, France and Argentina. It was a year and half out from the World Cup, we were also smashed by the All Blacks and Ireland, so it was the first port of call to fix the Springboks." Erasmus has overseen an improvement in the Springbok's fortunes. They beat New Zealand in Wellington in the Rugby Championship, beat England twice in the summer and lost narrowly to the All Blacks in Pretoria. In the short term, Rassie Erasmus and his assistants are to spread out across the country’s four Super Rugby teams to offer support as they look to harmonise preparations for next year's tournament in Japan.